According to a U.S. Geological Survey, the reserves in the Bakken Shale are enormous. Just how big is enormous? Well, the survey suggests 3.64 billion barrels of oil. 1.85 trillion cubic feet of natural gas. And 148 million barrels of natural gas liquids. The U.S. Geological Survey calls the Bakken the largest continuous accumulation it has ever assessed. Just How Big Is The Play? Just how much of this oil is recoverable? Well, the oil shale play's porosity is only about 5% and its permeability is very low - about 0.04 millidarcies. That is very low making this play a light, tight oil play. As recently as 2007, this region was considered marginal to submarginal, much like tar sands, because the oil was trapped within such low permeable shale. Thanks primarily to advances in oil well drilling such as hydraulic fracturing and directional drilling, the reserves in the Bakken Shale have been unlocked and earned its spot in oil history. North Dakota has also been propelled into the number two spot for oil production - second only to Texas. It is also almost the largest oil reserve ever discovered in the United States, second only to Alaska. 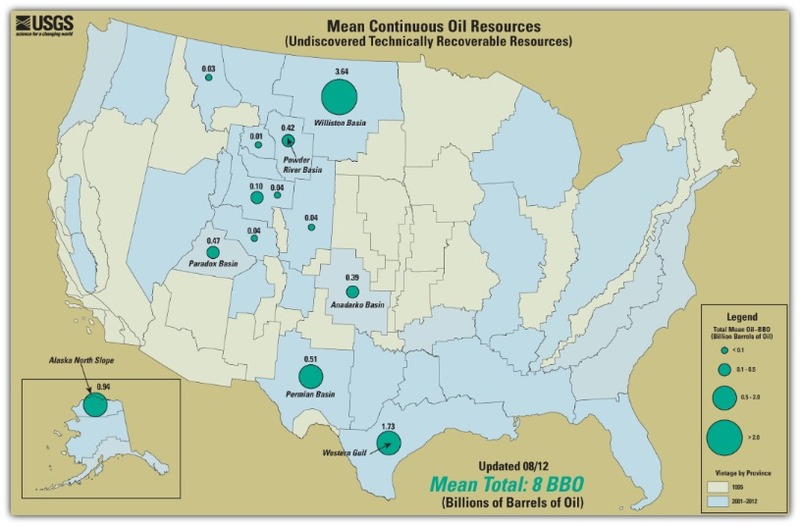 Due to technological advances, estimates of 10 billion barrels of oil reserves may be possible in the Bakken Shale. Initially, these estimates were ignored. However, with some wells producing as much as 2,000 barrels per day in initial production, the ten billion barrel figure is being questioned less often. The Bakken Formation is a part of the larger Williston Basin and consists of three layers: the upper layer is shale rock, the middle is layer of sandstone and dolomite, and the lower layer is shale. These layers are organic-rich and of marine origin. Beneath the Bakken Shale lies the Three Forks Formation. The three layers total about 145 feet thick, and the middle layer is considered, for now, the pay zone, although all three zones have been known to yield oil and natural gas. These deposits within the Williston Basin occurred during the Late Devonian to Early Mississipian era. The production from this zone is light, sweet crude, and is produced from depths of 10,000 feet. The middle layer is the kickoff point at which directional drilling begins. The laterals are up to 15,000 feet. 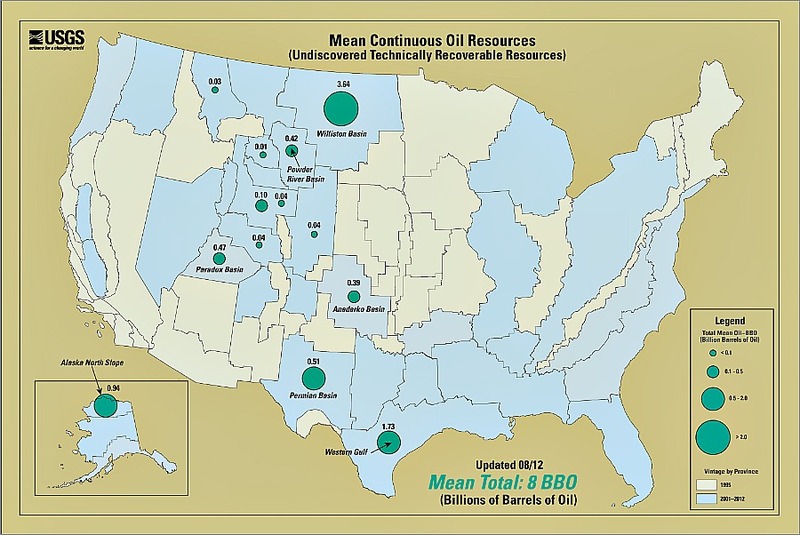 But the Bakken is not believed to be the only producing zone. Producers content the Three Forks Formation contributes to the oil production as well. As further exploration increases geologist's knowledge of the area, additional pay zones may be located. "Sweet spots" characterize the formation as not every well produces 2,000 barrels per day. These sweet spots are located in the Elm Coulee field in Montana and the Neeson Anticline and Billings Nose in North Dakota. These spots are "sweet" because of the natural fractures that occur in these areas. These fractures allow oil to flow more easily and be gathered into the wellbore. By the end of 2010, production was 485,000 barrels per day - exceeding the capacity to ship out. As of early 2013, oil production is around 700,000 barrels per day. Not bad considering that in 1995 the USGS believed there were only 151 million barrels of recoverable oil. Besides the oil, natural gas could hit a home run here as well. Despite Northwest North Dakota's rather sparse population, clusters of lights can be seen in night photos from NASA. What are they? Gas flares from Bakken Formation oil wells. Natural gas is flared, or burned, when it doesn't have a place to go - as in this case. A delivery system needs to be in place in order to produce compressed natural gas and this natural resource could be exploited as well. In the meantime, however, some companies have found ways to use the useless gas. They've set up mini processing plants on site to process the natural gas into a useable fuel for their rigs. Now, that's a great idea! Unfortunately, oil booms are not without problems. Just as Spindletop had Grinnell's Log Cabin Saloon where a man was killed every Saturday night, the Bakken Shale play has its own set of problems. TRANSPORTATION - Getting the oil production to market is a problem, however. No infrastructure exists to transport the liquid gold to a refinery and therefore, is hit hard with a discount at the wellhead. WEATHER - Not only is transportation to market a problem, but so is the weather! North Dakota can see temperature extremes of 40 below 0 during the winter. Additionally, massive amounts of snow can be dumped during the winter months. These huge amounts of snow then melt off in the spring and cause flooding. These environmental extremes can cause producers to shut-in wells until weather permits access. DRILLING AND PRODUCTION COSTS - If the price of oil continues to rise, so will the costs associated with it as more people jump on the bandwagon. Rig costs have increased as have labor costs. A single well may cost $10 million to drill and complete. WATER - Fresh water is always a concern when fracking is involved, but in the Bakken Shale, it is of utmost concern. Trying to juggle the needs of inhabitants and drilling producers is not a job to be envied. Not to mention the fact that the topic is hotly debated. The Bakken Shale encompasses parts of North Dakota, Montana, Saskatchewan and Manitoba. Its success is owed, in part, to advances in drilling technology. The first and foremost of these is directional drilling and fracking. However, don't forget also that high oil prices and low natural gas prices have helped the Bakken along as well. The horizontal drilling/fracking process was developed and perfected by the natural gas drilling industry. However, the low natural gas prices of 2009 forced producers to look elsewhere for profits. That meant a bust for natural gas and a boom for the Bakken. LACK OF WORKERS - With North Dakota boasting the lowest unemployment rate in the United States - quite impressive since the 2008/2009 recession - many people are packing their bags in search of their fortunes. Walmart is reportedly paying $18.50 per hour and McDonald's $13.50 per hour. We have received reports of only the drive-through being open at 3:00 in the afternoon at McDonald's because of lack of employees and Walmart bussing in workers from neighboring states. HIGH COST OF LIVING - And yet another source has reported that she left her lifelong home because of the crime and high prices the oil boom brought to her community. She stated that elderly people living in apartments traditionally costing $300 per month were thrown out in favor of oil workers that were willing to pay $2,000 to $3,000 per month. Sources have also reported to us that farmers have stopped farming and are, instead, putting in RV hookups that can be rented for $1500 per month. Another source reported that his search for riches was stopped short when he took his semi truck to North Dakota. Although the pay was good and the hours long, the cost of living and taxes made the venture not as profitable overall. The cost of housing is so high that North Dakota's Legislative Assembly is considering legislation that will help finance 2,500 new affordable housing units over the next two years. Unfortunately, 7,300 units are needed. The McKenzie County School District in Watford City is home to only 870 students. But, the school has had to get in on the housing crisis by providing housing for nine teachers on part of the playground and practice field. So what if the school district didn't help with the housing? You guessed it. No teachers. Unfortunately, there's no such thing as a free lunch. Not even in the Bakken Shale.